On November 30th, I departed Ohio with a group of 20 others for the island of Puerto Rico. It wasn’t a place I expected to find myself. I’m a medical student and in the middle of interview season for residency, which is a process that has been consuming most of my thoughts and energy for the past several months. On a Sunday morning about a month prior, my pastor announced the trip and asked for volunteers to go, and I was immediately weighted with the need to participate. I then spent several days trying to come up with excuses not to go – being away from family, being in the middle of interviews, needing to have guaranteed Internet access, etc. When my excuses came up short (my family was extremely supportive, and conveniently, I had no interviews or class scheduled during the dates of the trip), I reluctantly concluded that my reticence had more to do with fear than anything else. My pastor agreed, and encouraged me that he would at least be there – until, a week later, he got a bad case of appendicitis and was prohibited from flying. That left me committed to a nine-day trip with no one I really knew. What have I gotten myself into, I wondered, as I looked at all the unfamiliar faces in the group before we left. We left after Thanksgiving, before the first Sunday of Advent, and on the plane as I listened to Christmas music I felt the beauty of the season – Christmas, after all, is about the divine breaking into the world in unexpected ways, so that God could show His love tangibly, not just abstractly. This was the reason that initially stirred me to go on the trip, and what I clung to despite uncertainty about the rest: rather than simply acknowledging the devastation in Puerto Rico from a distance, through “thoughts and prayers,” I could make a physical difference for people who needed help. In his poem “Hammer is the Prayer,” Christian Wiman writes that “There is no consolation in the thought of God,” but that “hammer is the prayer of the poor and the dying.” Rather than simply the “thought” of God or Jesus, I wanted this trip to be an opportunity to be the hands and feet of Jesus – whatever that meant. I didn’t know what to expect; I just hoped I wouldn’t be miserable. Hurricane Maria struck the island of Puerto Rico on September 20, 2017. Hurricanes are not uncommon in the Caribbean, so most of the buildings on the island are designed to withstand heavy winds and rain. There were a few factors which made Hurricane Maria particularly bad: the first was the intensity – it made landfall as a high-level Category 4 hurricane, which is significantly higher than the average in the Caribbean. 2017 was a hyperactive year for hurricanes, with Harvey and Irma doing substantial damage in Texas and Florida, respectively, before Maria. Additionally, one of the local pastors explained that Irma was expected to hit Puerto Rico earlier in September and be quite severe, but caused very little damage. This, he said, created a sense of overconfidence that made the impact of Maria much worse. Maria struck from the south, and two months after the storm all the trees still lean a little bit to the northwest. As we drove around the island, I was struck by the disparity, some of which had to do with the hurricane and some of which may have just been unmasked by it. Some houses looked completely fine; they had either been spared or repaired quickly. Others were little more than piles of rubble. Across the island, electricity remained a major need. We saw countless poles down and tangles of wire seemingly everywhere, but in our week there I only saw a single crew working on power lines. Most of the metropolitan areas had power, but it was still spotty; in some of the rural areas, power is not projected to return until summer of next year. The economic disparity was apparent in the jobs to which our team was assigned as well. The church with whom we partnered was in the city of Guaynabo, and they had developed a system to organize the various volunteer teams coming in: community members and church members could come on Thursdays and Sundays and receive food, water, and other supplies they might need, and the distributions were run by a few paid staff with significant volunteer labor. Additionally, anyone could fill out blue sheets of paper describing what they needed done at their house or the house of a neighbor. The jobs varied quite a bit: rebuilding a metal roof, dismantling an uprooted tree with chainsaws, tarping leaky porches, repairing plumbing and drywall, cleaning debris, organizing a warehouse of supplies, and carrying food and water to people’s homes. In all these jobs, large and small, we saw unspeakable gratitude on the faces of the people we helped. Culturally, Puerto Rico is different than anywhere I’ve been. It’s a US territory, and although much of the familiar American mindset is present, it maintains its own distinct identity. There is a history to the island that predates the rest of our country; this was apparent in Old San Juan, where we saw stone forts approaching 500 years old. Although English is the official language, and I had heard that most Puerto Ricans were bilingual, many of the people we helped only spoke Spanish. Some of the communities we passed through looked like they had been lifted straight from Miami; others from a much poorer country. The island is very densely populated as well; it is 100 miles long and 35 miles wide, and approximately 4 million people call it home (although the population is decreasing as many young Puerto Ricans seek to leave the island and not return). Some of our jobs were in the mountains, over an hour from the city, but even in these “rural” areas we never drove more than half a mile before passing another house. Some homes were little more than a concrete base with tin walls and tarped roofs, reduced to ruin by the hurricane; others were quaint stucco chateaus. One afternoon, as we drove through a poor mountain community, we passed the governor’s vacation home on our way to the house we were assigned to fix, which had been leaking for two months. Throughout the week, something in me began to change and grow towards the people I interacted with. This included many locals, with whom I was humbled to work alongside. Many of these people talked about the severity of Maria compared to other hurricanes they’d seen; they were saddened by the destruction and how slow it has been to rebuild. There are mixed opinions on the support of both FEMA and the United States Government. 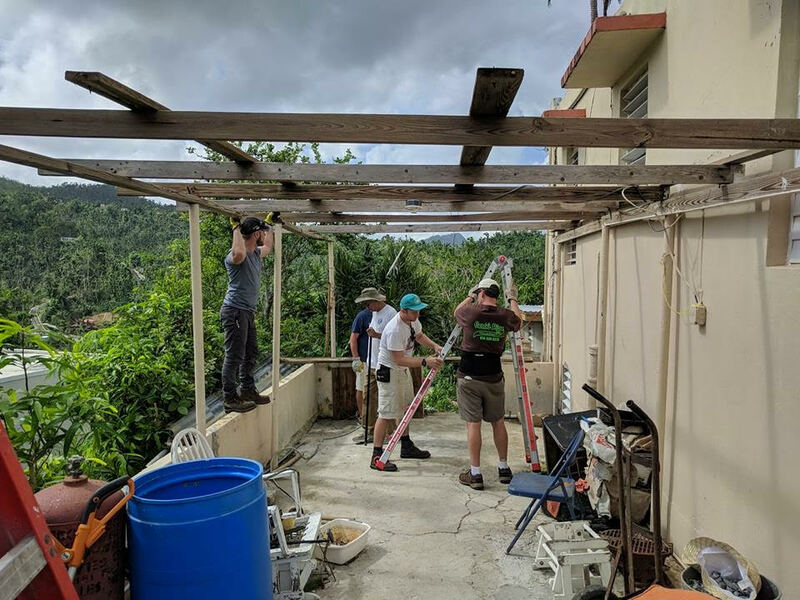 Some who were able to receive help through such resources have been grateful, but it appeared that a majority of the work was being done by volunteer workers, either local individuals, short-term volunteers through churches, or independent disaster relief organizations. In the beginning, FEMA and the military provided assistance clearing highways and by dropping food and water via helicopter to people in remote areas. As the projects became more complicated, though – such as repairing a whole roof – the bureaucracy and red tape made most jobs too slow and cumbersome. On the last day of our trip we heard rumors that FEMA was pulling out, despite many villages still desperate for help. Fortunately, our team was able to help people in real and significant ways. There is always some sense, on trips like this, of wanting to do more and wondering if we are really helping the most needy. This can lead to a service paralysis, in which we incorrectly focus on whether or not we are helping the right people and end up helping no one. I was grateful that our team avoided this; we were too busy working to help whoever we encountered to be burdened with guilt for the dozens more we didn’t have time or resources to help. We met a man with widespread prostate cancer who needed a new roof, so we paid for and installed it; later in the week, he walked an hour and a half to the church for food and water, and thanked us again for the job. I met an elderly woman who spoke no English as I carried her bags of supplies for her – she kept saying we were close to her house, as we walked nearly a mile. When we did arrive, she tried to pay me for the help. In addition to the Puerto Ricans we met, I became close with our group from the States. Some of the bond we formed was accelerated by the close quarters and some simply by doing hard work alongside one another. I am grateful for these relationships built as well, and it demonstrated further to me my own need to trust God in opening the door to new relationships. I knew almost no one on the trip before going, and as often happens during such experiences, I left with many new friends. I didn’t expect to connect so well with my team nor to feel such a sadness when we returned and went our separate ways. I showed up with low expectations and not much, I felt, to contribute; God showed up in my empty-handedness and provided a gift for me anyway. December is the last month of the year, but Advent, which begins four Sundays before Christmas Day, is the beginning of the Church year. Prior to Advent, the church finds itself in Ordinary Time. Leaving ordinary time and entering the season of waiting and expectation is supposed to remind us that God breaks into the world in unexpected ways, bringing hope and grace even to the ordinary. This is the story of the Incarnation, that singular event of God-with-us, but is also an ongoing story: He still surprises us when He brings life to dead places. The timing of our trip illustrated the point perfectly, as we left between the last Ordinary Sunday and the first Sunday of Advent. I was afraid to go because of how uncomfortable the idea made me; it was such a break from my typical life, from comfort, from my ordinary. I felt this physically upon arrival – we landed and I almost immediately began sweating due to the heat and humidity. Each night as I journaled, I wrote down the date – December something – and was always a little surprised at how it could be December, given the warmth and the palm trees and the beaches. Across the island, many homes had Christmas decorations up – this was also a little jarring, to see garland wrapped around a concrete pillar or several large nutcracker men lining a stucco house. I can admit my own Midwestern bias about expecting it to be cold in December and hoping for snow on Christmas; most Puerto Ricans have never seen snow. We visited during the “cold” season – 70s at night and mid-80s during the day. My body never really got used to the sun; I think this was the most I’ve sweated in a week in December, maybe ever in a week. Still, it felt good to do what we came to, and the presence of Christmas cheer and spirit across the cities and villages served as a beautiful reminder of the global nature of the Church, as well as the fact that God-with-us means all of us. I know this to be true, but somehow it felt more true surrounded by strangers on an unfamiliar land. If advent is about the divine breaking into our world in unexpected ways, then that is exactly what this experience did for me. I did not expect to make friends, I did not expect to make a difference, and I did not expect to be changed. Perhaps that was cynical, but the reality is I didn’t expect much from myself. I’ve been on mission trips before, but it had been awhile, and in that time I think I had forgotten what such an experience can do for those serving in addition to those being served. Our team showed up without knowing what would happen, and we were able to help many people. I say with all the reverence I can muster: I think God wanted to show me a few things on this trip, and I’m thankful for the people that pushed me to experience it instead of letting fear decide. It was humbling and beautiful to participate in such a restorative process, which reminds me again that God is always seeking to make the broken places whole. That includes the beautiful island of Puerto Rico, but also my heart and my life. When we begin to think that we know what to expect, God finds a way to surprise us, showing up in unexpected places. I don’t have a nice, neat explanation for everything I saw, but I know that in Puerto Rico we participated in the ministry of restoration, and I know that God was with us, because I felt Him. He enters into our ordinary time, whatever that is, and creates something extraordinary. And as our plane landed back in Ohio on December 9th, and our team spilled out and back towards whatever lives we had been living before the trip began, a layer of snow covered the ground.